If there is one thing I do not like, it is when people use their blog to promote their own music or that of their friends. 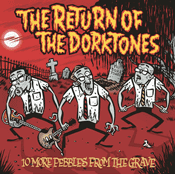 The Dorktones is a three piece band from Rotterdam, that play 60’s style garage beat. This in itself is nothing special, because everybody that I know plays in a retro band of some kind. 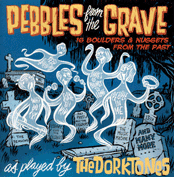 But The Dorktones are different, for a few reasons. First of all the drummer is Pieter Dorrenboom, who I regard as one of the best comic artists in Holland and who coincidentally happens to be a friend of mine. Of the other two band members I only know one ( Willem ) from his great podcast and the other ( Ernie ) because he is sometimes mentioned in the podcast. And of course I have seen The Dorktones on stage. Despite their efforts to make people believe they are crap, they are a great band. And their CD’s have some of the best artwork in my music collection. 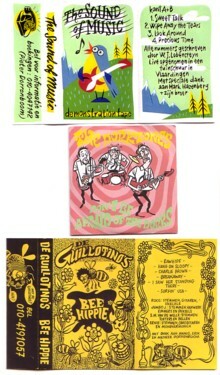 Because you can hear their music on their site, I thought I show you some of Pieter’s artwork, that is only mentioned on the site: two cassette sleeves and a limited edition mini CD. Well, okay, and one track: Romp & stomp by De Pinheads, from the rare cassette Live in New York, with a guest appearance of Pieter on organ! And for the non-Dutch: New York is a cheap hotel, one block away from where the whole band lives.